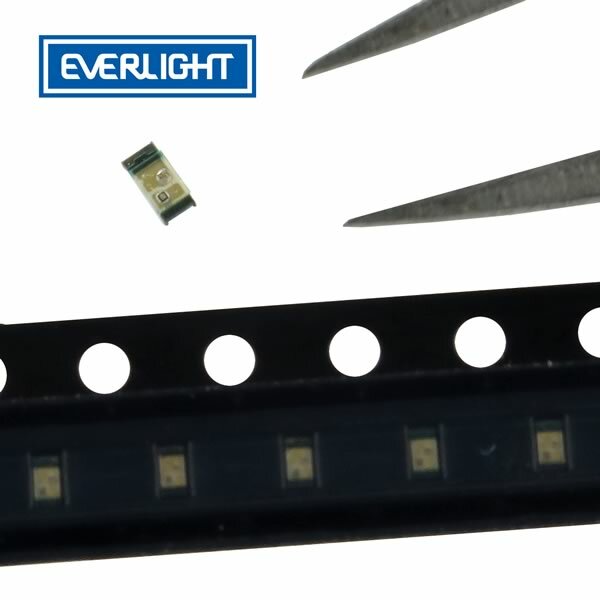 Ultra miniature Everlight SMD Blue (470nm wavelength) LED by Everlight measures only 1.6mm x 0.8mm x 0.4mm. The 19-117 SMD LED is much smaller than lead frame type components making it ideal for miniature applications. Features InGaN blue output from a water clear resin lens. Forward current is 10mA. Peak Forward current (Duty 1/10 @ 1KHz) is 100mA. Forward voltage is 2.6 to 3V. Power dissipation is 40mW. Peak luminous intensity is 11.5 mcd. Viewing angle is 120°. Part#19?117/BHC?YJ2K2TX/3T. On tape and reel. Sold in a package of 25.